Night 2 of the Battle of the North Championship in Dawson Creek, British Columbia was a slight bit cool and overcast, but track conditions were great and some fantastic racing was witnessed by the fans up in the Peace Country. Rookie driver Jordie Fike won his first career day money as a member of the WPCA Dodge Pro Tour after posting a time of 1:18.08. 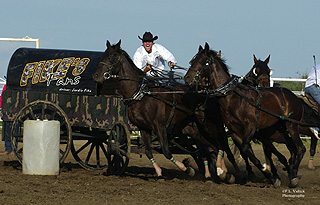 Coming off barrel number 2 in heat number 4, Fike, driving the Penn West Energy outfit placed first overall for the day by 9 one-hundreds of a second over Mike Vigen who placed 2nd on the night. Buddy Bensmiller, Chad Harden and Reg Johnstone filled out the top 5. The day money run moved Jordie Fike to the top of the aggregate standings with a 2-day combined time of 2:36.39, just 1 one-hundred of a second in front of day 1 winner Jason Glass, with Mike Vigen and Reg Johnstone making out the top 4. Chad Harden is in 5th place overall, 56 one-hundreds of a second out of 4th hole. The top 4 drivers in the aggregate after Saturday’s run will go into the sudden death championship final heat where the winner will take home the 2010 Battle of the North Championship and a $10,000.00 bonus cheque. Live coverage of the Battle of the North Championship from Dawson Creek, British Columbia can be heard starting at 7:15pm Friday and 7:30 on Saturday and Sunday on Classic Country AM1060 out of Calgary, 890AM CJDC out of Dawson Creek and 99.7 FM The Wolf out of Bonnyville.